My current main research interests include the study of morphogenesis and bio-imaging techniques. In the past I worked on mechanisms of morphogenesis, cell motility (2D vs 3D) and epithelial/mesenchymal transitions. I have worked with different model and non-model organisms, including cell cultures, sea-urchins, fish, amphibians, avians and mouse. Recently I have been focusing more on imaging Development with the OPenT. Some of what I am working on is available at the Haeckaliens site. I am also involved in numerous collaborations. Below are some of my past projects. Mechanics and mechanisms of somitogenesis - chick embryos are great for micro-manipulation and imaging (they develop flat on a surface). I use chick embryos for studying somitogenesis and gastrulation. Somites are transient embryonic structures which are formed early during development of vertebrates. They are the precursos of vertebrae and associated musculature, and they are the first morphological manifestation of the metamerized body plan ofvertebrates. Using chick embryos and both confocal and two-photon microscopy we showed that the formation of somites involves a complex choreography of morphogenetic movements which lasts much longer than the 90 thought to be necessary to complete the formation of one somite. We also demonstrated that fibronectin - an important component of embryonic extracellular matrices- is important for directing cell movements and for the correct positioning and orientation of cells within the somite. (3rd talk starting at ~29min). 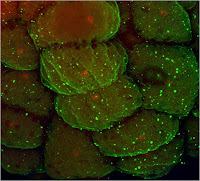 We have also looked into somitogenesis in mouse and zebrafish embryos. So far we have found similarities and differences in the morphogenetic mechanisms of somitogenesis in the three species. Mouse embryos are more challenging to work with, but the proximity to humans and the availability of mutants and genetic tools makes them an excellent model for functional studies. Most of the work we've done with mouse was in collaboration with the "Development and evolutionary morphogenesis" group (see here). 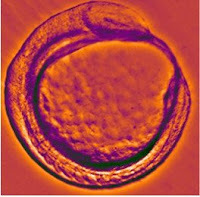 More recently we begun using mouse embryos to image on a prototypical optical tomography scanner which was built at FCUL. Mid-gestation mouse embryos are particularly challenging to image using conventional confocal microscopy. A lot of imaging was done with OPT in mice embryos already (see the Mouse Atlas project here) so by using mice we are testing the capabilities of our OPT prototype.system. 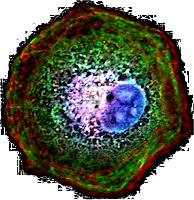 3D cell motility - Isolated cells in tissue-cell culture in vitro are great for observing the details of cell movements and studying the mechanisms of cell movement. However, cells migrating on 2D glass/plastic behave very differently from cells in vivo. 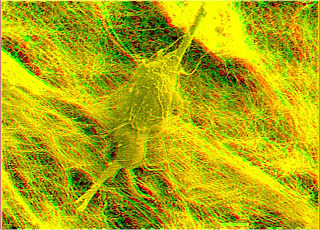 Working with John Kolega from the State University of New York at Buffalo we have shown that cytoarchitecture of endlothelial cells changes dramatically in 3D vs on 2D substrata and that microtubules (mediated by Rho GTPase signaling) are essential for proper control of cell protrusion and adhesion inside 3D pliable collagen matrices, although they are less important when cells form protrusions on 2D rigid substrata. Effects of poliploidy in early development - In collaboration with CBA's groups of Evolutionary Genetics and the master's student Joana Mateus (which I co-oriented with Ângela Inácio), we have begun studying the effects of polyploidy in the early development of the complex species Squalius alburnoides. Our preliminary data shows that poliploids develop at a rate different from that of diploids, giving support to the old proposition that early blastomeres have a mechanism to evaluate the "nucleo-cytoplasmic" ratio as a means to control cleavage rates. This work is also ongoing and we are looking for enthusiastic students to work on this project! 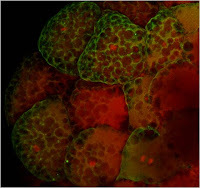 Gastulation in sea urchins and vertebrates - urchins are great for obtaining large batches of embryos, which are clear, morphologically simple, and develop rapidly being excellent for studying gastrulation and basic morphogenetic movements. Gastrulation is the process by which a single-layered embryo turns into a multi-layered organism, and in sea-urchin embryos (as well as all vertebrates!) the first organ which begins formation is the gut, known as archenteron - or primitive gut. Using confocal microscopy and 3D image reconstruction we demonstrated that the process of archenteron formation in the sea-urchin involves movements of cells from the outer layer. More recently I have started studying the mechanisms of axis extension in amniotes vs anamniotes. we have characterised the dynamics of axis extension in chick and zebrafish embryos, and the contributions of the notochord and extra-ebryonic tissues to this process. Zebrafish extension during the earlier stages is still poorly characterised, and is presumed to be linear; we have found data that shows otherwise. We have also compared the dynamics of growth of the different parts of the in zebrafish (a representative of anamniotes) and chick (amniote) and found interesting differences and similarities. I am looking for students to work on this project. More information about the students whom I work(ed) with and which produced some of the images, as well as their theses can be found on the students page. Articles which I have authored and contain some of these images, can be obtained from my Google Scholar profile.